In every issue we compile resumés on Dominicans who have succeeded or are succeeding in doing laudable things. 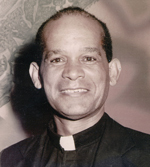 2014 On The Roadside of History: The Life and Times of Bishop Joseph Oliver Bowers, S.V.D.  Won the Co-operative Scholarship award to the Dominica Grammar School, in 1944.  Ordained to the priesthood in 1962 by Bishop Arnold Boghaert, at the Lady of Fair Haven Cathedral, in Roseau.  Was one of the mediators during the conflicts with the Dreads in Dominica, in the 1970’s and 1980’s.  Manager of the Dominica team in the Secondary Schools’ Caribbean Travellers Cheques Quiz Competition in 1983the team placed 2nd.  Spearheaded the fund-raising to build the Canefield Catholic Church.